This beer tonight is for all the Swede's who keep emailing me telling me that there is good beer in Sweden. I know there is good beer in Sweden I've just never been able to get any! Here (hopefully) is a good bottle of Swedish beer. Spendrups is the oldest and biggest brewery in Sweden. They have a number of sites around the country where they produce their beers, including the Gotlands Bryggeri which is their experimental brewery for new beers. In the near future there may even be a Gotlands beer reviewed... Stay tuned! But for now it's time for Spendrups Old Gold. 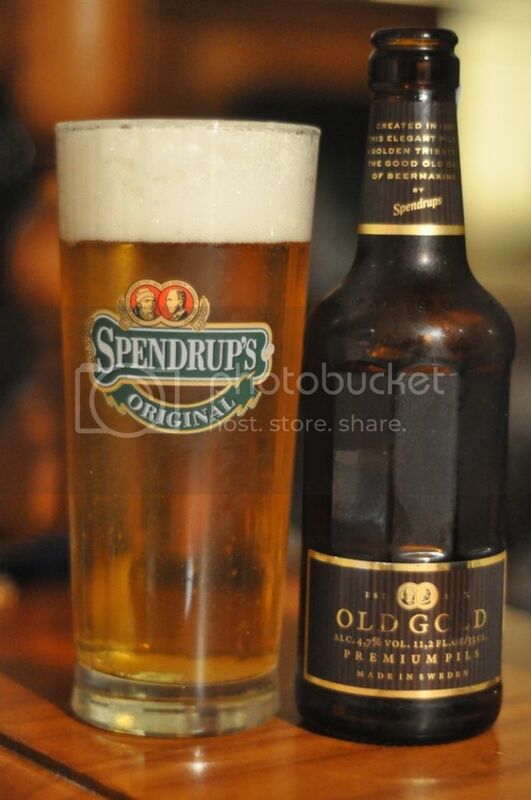 Spendrups Old Gold looks like you would want every single lager to look like! It's a beautiful golden colour with a three finger head of solid white foam on top. There is more than adequate carbonation rising to this head to sustain it for the entirety of drinking. The head laces the glass brilliantly. It's pretty close to the perfect looking lager, if this continues Sweden will finally have a good beer on Beer O'Clock Australia! I was crippled with hayfever today and so really struggled with writing something to do with nose. What I could smell was lots of grassy hops. They seem to be quite bitter and from the little I can smell incredibly dominant. This would be expected from a German style pilsner. So despite not being able to smell it properly I think I may be on to a winner here. After just one mouthful I know I've found that first good Swedish beer reviewed on here. It's quite bitter for the style with really impressive carbonation, it's so refreshing! The hops are grassy but also quite spicy and are very interesting! The malts are quite light in flavour and are biscuity. Overall it's a pretty impressive pilsner. Nils and Aleksander I hope you guys are both happy that I've finally found a good Swedish beer and reviewed it. Seriously it's a nice lager and so much better than Pistonhead, not that that's saying alot! I actually really enjoyed this beer and am really glad I bought a 4-pack. It's a nice easy drinking lager which will probably find it's way into the fridge again over summer. It's worth a shot if you like lagers.